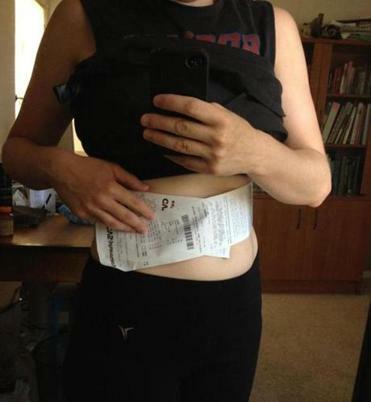 A CVS receipt was wrapped around a woman’s waist. In one photo, a man holds up a CVS receipt so long it towers above his head. Another features a woman who jokingly uses the paper strip to keep track of her figure. She’s down to her target waistline: half a receipt. 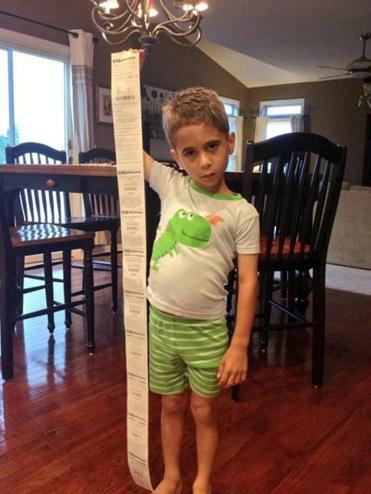 The drug store chain’s remarkably long receipts — some, jammed with coupons, are said to reach 6 feet — have become a social media sensation, sparking more than 8,000 Twitter posts that range from gentle ribbings to scathing reproaches. They include photos that employ children, dogs, and even pianos as units of measurement of the scroll-like slips. Some tweets call out the Woonsocket, R.I., company for wasting copious amounts of paper (“In the age of going paperless, [CVS] has gone clueless,” wrote @Bookwyrm76). Others try to one-up each other with Twitter’s version of a Comedy Central roast (“My CVS receipt just came out with the entire Torah printed on it,” read a tweet from @CompChristopher). There is even a Twitter parody account — @CVS_Receipt. The Internet frenzy has not only caught the company’s attention, it has convinced CVS to reduce the length of receipts, which are often stretched by discount coupons and cash credits for customers with CVS ExtraCare reward cards. CVS said last week that the typical length of its receipts will be chopped by 25 percent in coming weeks. Early next year, shoppers will be given the option of electronically sending all coupons and rewards directly to their cards. Price would not disclose the average length of a receipt. But he did concede they have grown longer over time as the CVS rewards program expanded. But John Deighton, a professor at Harvard Business School and a specialist in marketing and consumer behavior, said there is more to the lanky printouts than consumer savings. Like many businesses today, CVS is swimming in consumer data and the company’s rewards cards allow it to track every purchase. CVS receipts, each personalized by the discounts they offer, are evidence of how assiduously CVS monitors customer activity. “This is big data working right there in your face,” Deighton said. Long receipts may be ripe for online sniping and amusing smartphone photos, but Deighton said they are cheaper than the alternative. Price said CVS receipts use less paper than traditional direct-mail marketing, though the company did not offer any numbers. The act of handing over a receipt and announcing the savings on each purchase also gives the company a chance to make a personal connection with customers, he said. CVS said its ExtraBucks — essentially cash credits earned with purchases — is the most popular bonus, but the company would not say what percentage of coupons included on receipts actually get redeemed. Price said the increasing influence of social media — and the speed that information can travel — has pushed the company’s consumer-response operations into overdrive. Twitter and other sites have also amplified consumer clout, said Wayne St. Amand, executive vice president of marketing at Crimson Hexagon, a company that tracks social media engagement.